Did a short ground test of the new FMS (no time to fly an entire flight). - I can't change the departure runway set on the init page and have to use the old FMC window to do this*. - The "flap retraction schedule" is a really nice touch! Is this reflected on the PFD? - Once set, the mach number and weight for FL2 can't be cleared. Is this relevant if there is no more FL2 defined? - The new FMC blacks out if the old one is set to the "depart" and "arrival" page. Not a dealbreaker, but a bit confusing regardless. Maybe add a message that the page content can't be displayed or use a different variable name for the new FMC's pages**. - "MLW" is not displayed in lbs on the "APPR" page, even if the rest of the aircraft is. - The "APPR" page indicate that there's a second page, but there isn't. - Is the "Status" page on the "Menu" page supposed to be operational? - The "STAR" and "STATUS" entries on the "Menu" page are missing their ">"
- An operational "Del" button would be nice to delete the last entered digit (I have some example code for numerical data entry though). * What's the purpose of entering the departure runway anyway? Departure in low visibility? Filtering the SID list (this could be a nice feature, if a duplication of the runway in the flight plan after editing a SID can be avoided. ** Speaking of, we need to find a way to make the flight plan on the ND scrollable from waypoint to waypoint. Could be very hard to pull off though. Can with airport making experience someone check the data for TXL? I think the BRANE2L departure is mislabeled as "E" when it should be "WSW". I've also written Alex, the LNM developer, regarding a "stock FSX file name" export option for flight plans, so one won't have to rename it anymore before use by the FMC. Something I've been working on: An aircraft manager for everything a pilot needs before and during a flight. The value in the station load bars can be displayed in metric or imperial units or displayed as the number of passengers at a station. Data entry is easy. Click a station, type in the value on the keyboard and hit enter. To completely fill a station, enter a very high number and the gauge will automatically impose the stations load limit. Note that the weight summary at the bottom doesn't adapt to the selected unit of measure yet. This will be fixed. 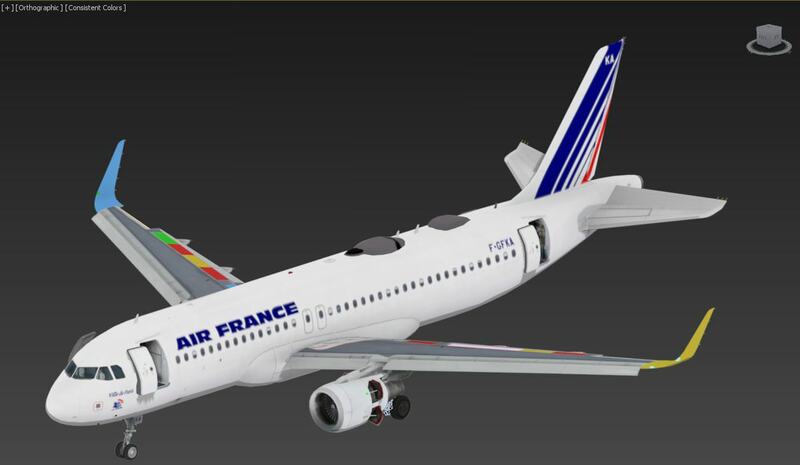 It will also automatically detect the presence of the aux tanks on the A321 (or A319CJ) and show them. Nothing to show for the door page yet. The "Config" page is going to be the heart of the aircraft. From there, you will be able to set everything from units of measure (weight, distance, etc.) to autosave intervals, ato-reset and everything else that's going to be relevant for configuring the aircraft. 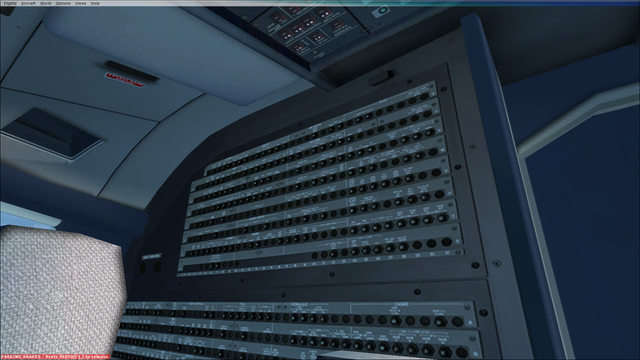 The panel in the top right will enable you to manually load/save and reset the aircraft. While this looks pretty complete, I need to pour in more work. Doors page, filling the config page and making the load/save buttons work. While this won't bring any modeling changes or new features to the table, it's a (very work intensive) solution to the night lighting, wing flex and antenna bugs of the present FSX native models. And, well, it'll come with Sharklets. And maybe as a cheap NEO model if I can find a source for the engine models. Still, as you can see with the uncolored parts, I'm not done yet. Since the model is very detailed with lots of animated parts, progress is slow. I also need to rewrite quite a bit of custom code (e.g. for the drooping control surfaces). And I haven't put it into FSX yet, so there's going to be quite a bug hunt. I've messaged Esa about publishing the model, but since he wanted to ask the other team members about it, I'm not sure when I'm going to get the "Go". Speaking of doors...can you create the DOORS and all other missing pages of the ECAMS if you find the time? They can display placeholder values if you want. I just want the graphical elements to be present when I get around to revising the aircraft systems while (re)doing the overhead panel. If you want to fly the A320's ancestor, check out Mario Noriega's awesome Dassault Mercure. 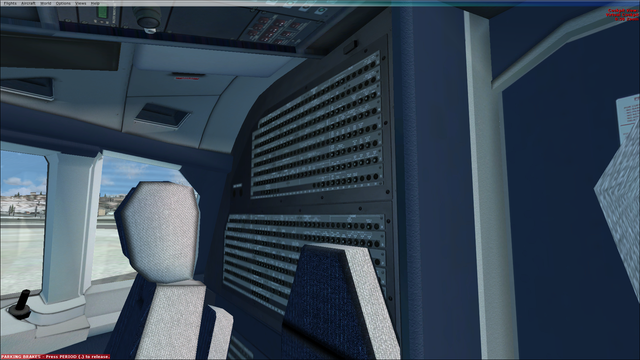 It's as feature complete as I want the A320 to be in terms of modeled systems and could easily pass as payware! This will enable review of the flight plan along its length without having to open the old FMC window. Scrolling the "LEGS" page in flight will shift the active waypoint! It's not just the DOORS page that's missing, but also the WHEEL and COND page. No worries about the MCDU. I just made the changes because you were on holidays. Hi! I tested quickly FMC and seems ok. It's an amazing work, among the rest of the Vc! Thank you. The only issue I found was about autopilot activation by pressing Z key: i can't get it on, it just shuts off immidiately after Z key press. But I was able to keep it on by pressing AP1/2 buttons. I have (or think to have..) the last updates 2.0b plus Bjoern modifications. That's the way it is at the moment. AP engagement/disengagement will have to be modified. Especially connecting the autothrottle arming to the AP_MASTER event is important, since switching off the autothrottle requires clicking the button on the FCU. Very impractical during manual landings. I see. Also Ap1 Ap2 buttons clickspots could be enlarged a bit. I need to click exactly on the led to have them on and sometime is not so confortable. The clickspots are the size of the buttons, therefor: No enlargement. I tried installing the new MCDU and FSX crashes right after selecting the A320. I don't really know which file is causing the problem. I have a few observations and one question. Using panel 1.60 and 155a aircraft pack of the A320, I lose twice now all controller input on approach if I must overcorrect too much V/S. I think it may be triggered when the A320's real input overcorrections are rejected, but I have no idea really. Another thing, ILS and APP buttons are non-functioning, FD works as expected. Out of curiosity, how to use the .KMZ file to track flight on Google Earth? FSX shouldn't crash because of a single XML file. Check that you've installed it correctly. My installed version is the 19/11/2017 fork plus the modified new MCDU (with the modified MFD). The next release will contain the new MCDU and the load manager, but the latter is not complete yet. I only use ILS and APP when the aircraft has successfully captured the localizer and glideslope and the course is set to the runway heading and it always works for me. Lack of - or very sluggish - controller input without autopilot is a drawback of the default fly-by-wire system. More recent versions have worked around this, but they're not official yet. If you're willing to experiment, you can try a work-in-progress version. It's successfully flight tested by now, but requires a bit of work to install. You'll need to transfer the repaints from your current A320 installation and transfer the sound sets (or use the one suggested in the readme). François, sometimes FMC looses vertical navigation control. I need to switch to the selected. This happened also before Bjoern mods. Is it related to wpy deletion that sometimes I do in flightplan? Or something else? Hi Bjoern, I realized that Radio Control Master Switch enable also voltage currents to A/P, otherwise A/P buttons cannot work. Is it intended? In case is it possible put a Ecam Memo (i.e. A/P bus On)? So, If you delete a waypoint of a SID or a STAR or an approach, there is many chance that occurs issues and bugs. It is highly recommanded to not delete waypoint of freenav procedure. If you don't want fly a waypoint, use the "+" button on the FMC map to shift the current active waypoint. It controls the avionics master switch, which also controls the autopilot power supply. Someone was asking about P3Dv4 lights and it got deleted for being OT which is fair enough. However heres a bit of on topic advice. Set 2 keys for landing lights forward and back and this massively improves the lights. For some reason the A321 has these controls reversed. Set them back in the air or you will have trouble reading the instruments. Just to make this clear beforehand: Should I ever (be allowed to) release updated exterior models, they will not be equipped with dynamic lights because I do not own P3Dv4. However, licensing terms permitting, others are free to try to add them by means of Model Converter X or else. If you have to reload the aircraft to clear this bug, there is most likely a "lock" variable that's not being reset after a flight plan change. I'm thinking about a way to step through the flight plan in PLAN mode on the ND without altering the currently selected waypoint for the AP's LNAV mode. Have you already considered something like this? Found a working solution. The ability to delete waypoints is retained. Still working on how to mark a waypoint as active for LNAV. Because otherwise, you would not even think about switching the RMP on. Because avionics -> ATC. Or I could force mute the audio channels without the RMP. Maybe in a later version. A new revision of my modified, new MCDU. Only the LEGS page and associated buttons were changed* (and the MFD). Previewing your entire flight plan on the ND (PLAN page) without interfering with the autopilot. You can now fix flight plan errors (bad waypoints, duplicate waypoints or else) and/or change the active waypoint without having to pause the simulator. I'll leave it up to François to add this to his new MCDU or implement his own solution, but as I've said, I consider the flight plan preview on the ND an essential feature. *François: Use Diffchecker.com to find differences between this and the old version (or whatever version you are using). They will be equipped with dynamic lights! All the planes that use default lights have dynamic lights, the only ones that aren't dynamic are the ones built into the model like some payware companies do. Just leave the lights as they are and they will be dynamic. So how do you capture the localizer? With Loc button? I normally would activate ILS passing 10000 feet and then APP to capture localizer when lined up but these buttons do not light up at all but are clickable. Tune the frequency, set the course, be within 30 nm of the localizer and then press the ILS button. Isn't this covered in the manual? After the ILS localizer is recognized (ILS button pressed) then press the APPR button to let capture the ILS path and slope. I think it'ok as it is. In future you might connect AP to Battery master switch (as in reality it should I guess), and leave Radio switch just for energize RMP. I have an issue on PFD: i can see both old and new TCAS icons! First, you're talking about the ND. Second, the TCAS display is still buggy. Apologies to Flyer10. I asked aroud a bit and learned that all attachpoint lights will indeed render as dynamic in P3Dv4 without any interference by the user or modeler. No problem, I wasn't going to argue as I was only 90% sure. it's good news for everyone. You carry on as normal and P3Dv4 users get dynamic lights. So these buttons remain inoperative and unlit until a certain distance from the airport? I havn't had time to make a flight since I last posted, but sometimes it's useful to use the ils when coming downwind of the runway. But in François Airbus you can activate them only at "speed" mode during approach phase. Ok thx, next flight I'll give it another go. ALMOD and GN200 waypoints won't even be added to FMS, there no duplicated points in the procedure, the points appear in FSX flight planner without any duplicate. I don't know why. Is there any another solution rather than make it user waypoint? I install the HEGN airport and the HEGN_Waypoint.bgl in FSX. I made a flightplan and the waypoints works correct. They also come just in PLAN-G correct.But the runways in stock FSX are different than in your airport files. Please add it from FD_FMC and see if it will work. I use the 2D panel. I open the flightplan "IFR Asyut Intl to Hurghada Intl". I open the FD_FMC and select the STAR "ALMOD 1a". Then I open the "ARRIVAL" page and see the selected STAR with the waypoints ALMOD and GN200. So I see no problems. You can add two approaches to your airport. One for RWY16L and one for 16R, both with IAF GN711. Make thefore a one-waypoint STAR with the waypoint GN711. Finally it worked, the problem was with compiler, When I used the compiler comes with the toolkit it worked without any problems. I have placed all specifics data and formula linked to an aircraft model (here A320) in a specific gauge and I use now L:Vars in other gauges to allow to get common gauges for all A32x versions. Feel free to change the code as you see fit, it was just intended to provide basic functionality. That's great news and should make things much more flexible. Now, 417 airports in our Airbus FMC ! send you a PM please look at ! 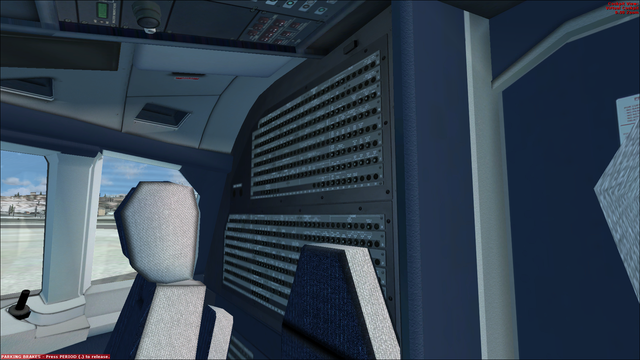 I started to work on a321 VC textures again.Expect overhead fuse panel and back wall fuse panel in HD.I will give download link to fdd_fr and he will give you link. Bjoern can you give link of your last cockpit update and how to install it.You give me link once but I forgot where is it.Thank you. If anyone wants to assign their controls to their hardware, I have figured it out. You need a paid version of FSUIPC. Create a text file but call it FDFMC.mcro and out it in your modules folder. Paste the following into it. Then assign your buttons via FSUIPC, I have used a short and long click on my saitek panel to get the push pull functions. The freeware version of spad lets you do that. A 1 parameter turns on the button or does a push, a zero parameter turns off the button or does a pull. Also, you wanted to change the TAWS button coordinates, that can be done but where can I find the current coordinates? Last edited by Flyer10 on 10 Feb 2018, 15:41, edited 1 time in total. Note: Do not do the overhead and ND control panels yet. These will require an overhaul in terms of layout.